Chord and Emma’s relationship is more than just Sun sign compatibility of Aquarius and Aries. No individual is a pure Aquarius or Aries but instead is a unique combination of signs and planets. The following interpretation defines the synastry or interplanetary aspects between the planets in Emma’s birth chart and the planets in Chord’s birth chart. There is no evil planet in the combinations. No single combination can make or break the relationship. The list goes from the most harmonious (positive) to the most discordant (negative). Chord’s Sun Trines Emma’s Jupiter (+9.39 harmony) – Chord’s sense of identity, ego, will, and character combine very effortlessly with Emma’s spirit of growth, expansion, or generosity. There is harmony in Chord and Emma’s goal of expanding their horizons. There are much optimism and enthusiasm in the relationship. Chord inspires Emma to plan big dreams. Emma will make Chord feel terrific. This aspect helps bring good luck and financial success in a business partnership. Emma’s Mercury Trines Chord’s Neptune (+9.07 harmony) – Emma’s mentality and powers of perception combine very effortlessly with Chord’s sense of spirituality, imagination, or mystical inclination. There is harmony when Chord inspires the creativity of Emma. Emma’s practical suggestions give form to Chord’s abstract ideas. Both can discover many interests through excellent communication. The relationship brings a feeling of great pleasure and happiness through sharing of creative projects. Emma’s Venus Sextiles Chord’s Neptune (+6.23 harmony) – Emma’s sense of sexuality, attraction, or intimacy combines pleasantly with Chord’s sense of spirituality, imagination, or mystical inclination. There is stimulation in each other’s mutual interest in nature, religion, art, music, or arcane studies. The relationship brings out kindness, sympathy, and generosity toward each other. Emma is willing to overlook Chord’s faults. Chord is delighted to be loved in such a sophisticated manner. Emma’s Sun Sextiles Chord’s Sun (+4.45 harmony) – The individual sense of identity, ego, will, and character combine pleasantly with the couple. The similar temperaments of Emma and Chord can stimulate each other to achieve their goals in life. There is a strong sense of compatibility between Chord and Emma. Both are supportive of each other’s basic needs. This aspect is mutually beneficial for marriage. Emma’s Neptune Sextiles Chord’s Pluto (+4.38 harmony) – Emma’s mystical or spiritual inclination combines pleasantly with Chord’s sense of transformation, change, or power and destiny. The spiritual urge of Emma stimulates the reforming urge of Chord. Both will support and encourage each other’s spiritual enlightenment. The relationship inspires each other to meet the world with compassion and grace. Emma’s Venus Sextiles Chord’s Saturn (+4.36 harmony) – Emma’s sense of sexuality, attraction, or intimacy combines pleasantly with Chord’s sense of commitment, necessity, or duty. Chord’s protective nature stimulates Emma’s loving nature. Trust is a rare and precious part of the association. This aspect is good for a long-term relationship. Emma’s Mercury Trines Chord’s Saturn (+4.12 harmony) – Emma’s mentality and powers of perception combine very effortlessly with Chord’s sense of commitment, necessity, or duty. Chord helps give form to Emma’s ideas. Emma learns a lot from Chord’s knowledge and wisdom. There is harmony when Chord offers practical guidance that improves Emma’s life. Both tend to solve relationship problems through careful and logical communication. This is a favorable aspect for long-term relationship including business partnership. Chord’s Jupiter Trines Emma’s Saturn (+3.62 harmony) – Chord’s sense of growth, expansion, or generosity combines very effortlessly with Emma’s sense of commitment, necessity, or duty. Emma’s practicality is in harmony with Chord’s expansive ideas. Chord provides vision while Emma creates structure. Both work better as a team to achieve significant goals. This aspect is also favorable in a business partnership. Chord’s Moon Trines Emma’s Pluto (+3.50 harmony) – Chord’s emotional needs combine very effortlessly with Emma’s sense of transformation, change, or power and destiny. There is harmony in the magnetic mental attraction between Chord and Emma. Both are supportive and psychologically intimate with each other. The relationship can be profoundly sexual. This aspect is suitable for any political, professional, or business partnership. Chord’s Sun Sextiles Emma’s Moon (+3.07 harmony) – Chord’s sense of identity, ego, will, and character combine pleasantly with Emma’s emotional needs. 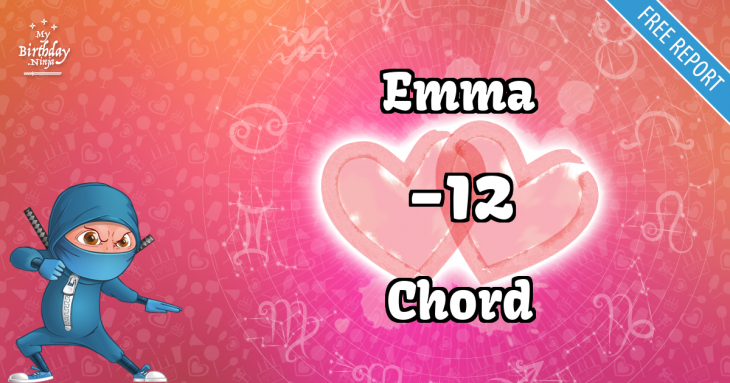 There is a natural stimulation and flowing compatibility between Chord and Emma. Reconciliation after a disagreement is ordinary. This is an ideal aspect to have in a romantic relationship. Emma’s Sun Trines Chord’s Uranus (+3.01 harmony) – Emma’s sense of identity, ego, will, and character combine very effortlessly with Chord’s sense of independence, freedom, and originality. Chord’s unusual nature blends harmoniously well with Emma’s highly creative life. The relationship stimulates each other’s innovation and exchange of progressive ideas. There is a smooth flow of encouragement and individualism between Emma and Chord. Emma’s Venus Trines Chord’s Pluto (+2.95 harmony) – Emma’s sense of sexuality, attraction, or intimacy combines very effortlessly with Chord’s sense of transformation, change, or power and destiny. There is harmony when both enjoy moving forward and growing through the relationship. There are feelings of relief and enlightenment after a relationship challenge. The magnetic attraction between Emma and Chord makes it impossible to separate them permanently. Chord’s Mars Trines Emma’s Neptune (+2.80 harmony) – Chord’s sexual drive, temper, and powers of self-assertion combine very effortlessly with Emma’s sense of spirituality, imagination, or mystical inclination. There is harmony in the equal exchange of sympathy and compassion. Chord helps Emma fight procrastination. Emma inspires Chord to more significant achievements. Emma’s Venus Sextiles Chord’s Uranus (+2.13 harmony) – Emma’s sense of sexuality, attraction, or intimacy combines pleasantly with Chord’s sense of independence, freedom, and originality. There is stimulation that brings out the latent creative genius in each other. A mystical or glamorous aura is present in the relationship. Chord surprises Emma in one way or another. Emma has a pleasant way of toning down Chord’s eccentricity. Chord’s Neptune Sextiles Emma’s Pluto (+1.57 harmony) – Chord’s mystical or spiritual inclination combines pleasantly with Emma’s sense of transformation, change, or power and destiny. The spiritual urge of Chord stimulates the reforming urge of Emma. Both will support and encourage each other’s spiritual enlightenment. The relationship inspires each other to meet the world with compassion and grace. Chord’s Sun Conjuncts Emma’s Venus (+1.07 harmony) – Chord’s sense of identity, ego, will, and character combine with Emma’s sense of sexuality, attraction, or intimacy. Chord has the same social interests and cultural values as Emma. There is an increased understanding of one another. The relationship encourages love, happiness, contentment, and creativity. Both Emma and Chord enjoy each other’s company. Chord’s Mars Trines Emma’s Uranus (+0.56 harmony) – Chord’s sexual drive, temper, and powers of self-assertion combine very effortlessly with Emma’s sense of independence, freedom, and originality. There is harmony in stimulating a productive sense of adventure. Both encourage confidence, aggressive drive, and initiative in each other. Emma’s Moon Sextiles Chord’s Venus (+0.45 harmony) – Emma’s emotional needs combine pleasantly with Chord’s sense of sexuality, attraction, or intimacy. The relationship stimulates deep mutual devotion and affection in each other. Both tend to be liberal on financial matters. Emma and Chord have common interests in many things including social activities. There is a strong attraction for love and marriage between Emma and Chord. Emma’s Uranus Sextiles Chord’s Pluto (+0.40 harmony) – Emma’s sense of independence, freedom, and originality combine pleasantly with Chord’s sense of transformation, change, or power and destiny. The relationship stimulates the expression of individuality or spiritual unfoldment in one or both individuals. Both help each other to stand up for their beliefs. Chord’s Saturn Sextiles Emma’s Pluto (+0.38 harmony) – Chord’s sense of commitment, necessity, or duty combines pleasantly with Emma’s sense of transformation, change, or power and destiny. Chord’s practical and hardworking nature stimulate Emma’s power of transformation. Chord can give stability to Emma’s feelings of loneliness. Emma can strengthen Chord’s sense of authority. Emma’s Uranus Conjuncts Chord’s Uranus (neutral) – The individual sense of independence, freedom, and originality combine with ease between the couple. Both Emma and Chord complement each other’s individuality and independence. There is mutual appreciation in the relationship. Both bring out the eccentric side of one another. Emma’s Uranus Conjuncts Chord’s Neptune (neutral) – Emma’s respect for expression of individuality combines with Chord’s mystical, spiritual inclinations. There may be a similarity of social or political views between Emma and Chord. Each partner will share radical new ideas. The relationship gives a feeling that anything is possible when both are together. There is a creative union of rebellion and idealism. This can sometimes encourage Chord or Emma to evade responsibility. Emma’s Pluto Conjuncts Chord’s Pluto (neutral) – The individual sense of transformation, change, or power and destiny combine with ease within the couple. Emma and Chord enjoy the same cultural references. Chord and Emma have a great time talking about the good old days since both came from the same generation. Emma’s Neptune Conjuncts Chord’s Neptune (neutral) – The individual sense of spirituality, imagination, or mysticism combines with ease within the couple. Both Emma and Chord share the same tastes in art, music, or religion. The relationship encourages positive traits of creativity and dreaminess. It also has the tendency to promote negative characteristics of laziness or indecisiveness in Emma or Chord. Emma’s Moon Conjuncts Chord’s Uranus (neutral) – Emma’s emotional needs combine with Chord’s sense of independence, freedom, and originality. The fusion excites mutual interest and is intellectually stimulating. There’s a degree of spontaneous, unexpected, and magnetic attraction linking Emma and Chord. Boredom is never a problem in the relationship. Sometimes Emma’s traditional attitude clashes with Chord’s odd behavior. The union arouses romantic feelings that can be temporary unless other harmonious aspects support it. Chord’s Venus Conjuncts Emma’s Mars (neutral) – Chord’s sense of sexuality, attraction, or intimacy combines with Emma’s sexual drive, temper, and powers of self-assertion. Emma’s desire fuses with Chord’s loving nature. Both are magnetically attracted to each other. Emma can be jealous or possessive. Chord has a soothing effect on Emma. Chord’s Uranus Conjuncts Emma’s Neptune (neutral) – Chord’s respect for expression of individuality combines with Emma’s mystical, spiritual inclinations. There may be a similarity of social or political views between Chord and Emma. Each partner will share radical new ideas. The relationship gives a feeling that anything is possible when both are together. There is a creative union of rebellion and idealism. This can sometimes encourage Emma or Chord to evade responsibility. Chord’s Sun Squares Emma’s Pluto (-0.18 discord) – Chord’s sense of identity, ego, will, and character interact stressfully with Emma’s sense of transformation, change, or power and destiny. There is friction in the random testing of loyalty and tolerance in the relationship. Both will resist any attempted change imposed by the other. The aggressive personalities of Chord and Emma can cause damage to the relationship. Emma’s Jupiter Opposes Chord’s Uranus (-0.70 discord) – Emma’s sense of growth, expansion, or generosity confronts and challenges Chord’s sense of independence, freedom, and originality. There is tension in the radical views and differences in social or religious ideas. One or both will show extravagance and resistance to responsibility. Chord’s Jupiter Opposes Emma’s Pluto (-0.79 discord) – Chord’s sense of growth, expansion, or generosity confronts and challenges Emma’s sense of transformation, change, or power and destiny. Personal struggles between Chord and Emma can’t be avoided. There will be conflicting ideas that can lead to misunderstanding or make cooperation difficult. Emma’s Mars Squares Chord’s Mars (-1.34 discord) – The individual sexual drive, temper, and powers of self-assertion interact stressfully within the couple. There is friction in own wills and desires. Everyday activities together can lead to conflicts. Cooperation is difficult to achieve between Emma and Chord. Each one fears the other’s anger. This aspect is challenging to deal with. Emma’s Jupiter Opposes Chord’s Neptune (-2.49 discord) – Emma’s sense of growth, expansion, or generosity confronts and challenges Chord’s sense of spirituality, imagination, or mystical inclination. There is tension in spiritual or philosophical beliefs. The relationship has the tendency to encourage bad habits of extravagance, gambling, or laziness. Chord’s Mercury Conjuncts Emma’s Saturn (-2.81 discord) – Chord’s mentality and powers of perception may combine with Emma’s sense of commitment, necessity, or duty. Chord may feel inadequate when Emma imparts knowledge and wisdom. Emma has the tendency to discipline Chord. Chord may feel the pressure of responsibilities demanded by Emma. Chord can talk Emma out of negative attitudes. Chord can encourage progressiveness in Emma. Chord’s Sun Conjuncts Emma’s Mars (-3.03 discord) – Chord’s sense of identity, ego, will, and character combine with Emma’s sexual drive, temper, and powers of self-assertion. The creativeness of Chord combines with the aggressiveness of Emma. Friendly competition is typical in the relationship. There is a physical attraction between Emma and Chord. Emma’s Mercury Conjuncts Chord’s Mars (-3.40 discord) – Emma’s mentality and powers of perception combine with Chord’s sexual drive, temper, and powers of self-assertion. Both stimulate the exchange of ideas and self-expression in each other. The relationship inspires a lively and productive conversation. Friendly debates can sometimes lead to irritation if Chord is headstrong or argumentative. Chord can be impatient and wants immediate action while Emma intends to plan before taking any action. Chord’s Moon Opposes Emma’s Neptune (-4.09 discord) – Chord’s emotional needs confront and challenge Emma’s sense of spirituality, imagination, or mystical inclination. There is tension in the overly sensitive moods and feelings in the relationship. Chord can overreact to the confusion caused by Emma. Emma can be deceptive or dishonest to Chord. Both are capable of keeping secrets to each other that can lead to misunderstanding. This aspect is terrible in marriage. Emma’s Sun Squares Chord’s Mercury (-4.84 discord) – Emma’s sense of identity, ego, will, and character interact stressfully with Chord’s mentality and powers of perception. There is friction due to improper communication between Chord and Emma. Misunderstanding and conflict of ideas are common in this aspect. Chord might be too aggressive in communicating with Emma. Chord’s Saturn Conjuncts Emma’s Uranus (-5.42 discord) – Chord’s sense of commitment, necessity, or duty combines with Emma’s sense of independence, freedom, and originality. Emma is radical and rebellious while Chord is conservative and methodical. The relationship can show an excellent fusion of practicality and vision if both can respect each other’s differences. Emma’s Jupiter Opposes Chord’s Saturn (-5.81 discord) – Emma’s sense of growth, expansion, or generosity confronts and challenges Chord’s sense of commitment, necessity, or duty. There is tension in Chord’s restrictive nature and Emma’s dreams of expansion. There can be disagreement on financial or business procedures. Emma’s Mars Squares Chord’s Jupiter (-6.40 discord) – Emma’s sexual drive, temper, and powers of self-assertion interact stressfully with Chord’s sense of growth, expansion, or generosity. There is friction in Emma’s instincts and Chord’s ethical point of view. There is a natural tendency to be extravagant in one or both individual. Chord’s Saturn Conjuncts Emma’s Neptune (-6.85 discord) – Chord’s sense of commitment, necessity, or duty may combine with Emma’s sense of spirituality, imagination, or mystical inclination. This aspect is neither beneficial nor harmful to the relationship. Emma can add a degree of holiness to Chord’s practical goals in life. In some cases, there will be doubts, deceptions, and misunderstanding in the relationship. Emma’s Mercury Squares Chord’s Venus (-6.94 discord) – Emma’s mentality and powers of perception interact stressfully with Chord’s sense of sexuality, attraction, or intimacy. There is an exciting exchange of ideas that later on can cause friction in the relationship. There may be occasional small misunderstandings between Emma and Chord. One listening to the other is a hit or miss. Emma tends to disregard the emotional needs of Chord. Chord may find Emma cold and calculative. Chord’s Venus Squares Emma’s Pluto (-7.31 discord) – Chord’s sense of sexuality, attraction, or intimacy interacts stressfully with Emma’s sense of transformation, change, or power and destiny. There is an intense and sometimes uncomfortable sexual attraction in the relationship. There is friction in dealing with issues of jealousy, possessiveness, and volatile emotions. The association may breed anger and even hatred of one another. Emma’s Sun Squares Chord’s Moon (-10.23 discord) – Emma’s sense of identity, ego, will, and character interact stressfully with Chord’s emotional needs. There is friction in basic temperaments and personalities. Emma’s domineering personality can overwhelm Chord’s emotional and sensitive nature. Chord can appear moody to Emma’s inconsiderate behavior. Emma’s Mercury Opposes Chord’s Pluto (-14.31 discord) – Emma’s mentality and powers of perception confront and challenge Chord’s sense of transformation, change, or power and destiny. Chord has a natural tendency to dominate if Emma appears weak. There is tension in the relationship that both Chord and Emma will be uncomfortable with each other. The intensity can sometimes feel overpowering. Emma might have difficulty being heard out of fear of making Chord unhappy. Chord’s Mars Opposes Emma’s Pluto (-14.81 discord) – Chord’s sexual drive, temper, and powers of self-assertion confront and challenge Emma’s sense of transformation, change, or power and destiny. There is tension in each other’s resistance to display of authority by the other. Both can be vindictive toward each other. There is intense competition in the relationship. Chord’s Moon Opposes Emma’s Saturn (-17.19 discord) – Chord’s emotional needs confront and challenge Emma’s sense of commitment, necessity, or duty. The tension can easily create misunderstanding between Emma’s practicality and Chord’s emotions. Both have opposite ways of handling everything from finance, lifestyle, and stress. Chord resents Emma’s constant discipline. Emma is frustrated by the moody disposition of Chord. Emma sees the conservative and safe side of any situation. Chord sees the intuitive and magical side. There are 6 mutual receptions in Emma and Chord’s planet combinations. Planets in mutual reception enhance each other. This will add +60 harmony to the total score. The remaining -20.57 discord is due to some minor aspects or planets in parallel. This is only a quick assessment of the relationship compatibility between Emma and Chord. If both place and time of births are known, an in-depth interpretation is available in the Star Lovers Report. Try a free sample with no obligation to buy. Ssshhh! Emma, don’t let Chord know. You are most compatible with a person born on February 15, 1987. You have a whooping birthday love match score of +140 with that person. Check it out and imagine what it feels like to be with your soul mate.